I live on Shekou Gongye Number 8 Road, translated, my address is “Shekou Industry Road #8”. 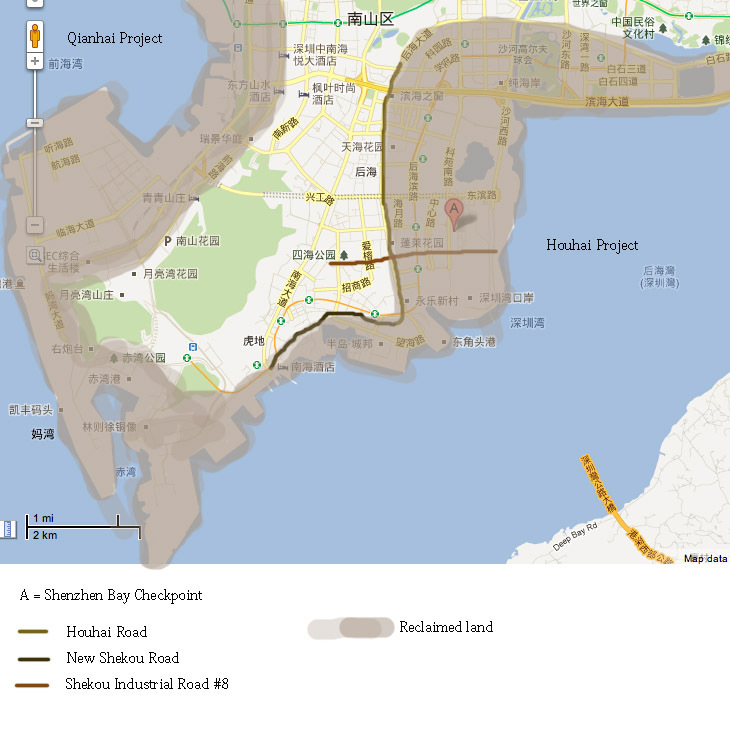 There are 10 industry roads in Shekou, remnants of the Shekou Industrial Zone. Walking these roads gives a good sense of not only how the city is gentrifying, but also the different street lives that various generations of urbanization have engendered. On #8, Houhai Road also divides the area into two different kinds of street life. The older section has concrete sidewalks that connect housing developments with 7 story walk-ups, community park areas with local foliage, and simple (also concrete) benches. The gate between the housing development and the street is a security bar that controls traffic flow in and out of the area. The new section has stylized sidewalks that are embellished with granite and marble at residences. The buildings are over 20 stories, the community park areas landscaped with imported topiary, and the benches ornate designs of iron and wood. The gates are over one story high with faux noble emblems that control pedestrian traffic in and out of the development because cars have a separate entrance that leads to underground parking. During the day, the older section bustles with ad hoc businesses — soybean milk and steamed bun venders, people sitting on plastic chairs chatting, and various kiosks selling drinks, snacks, and newspapers. In the newer section, all these activities take place indoors and no one uses the public benches because the trees haven’t grown in enough to give shade. At night, in the older section a bbq station sets up and older people play chess. In the newer section, several entrepreneurs have set up roller blade classes for the children of the housing estates. All this to make a simple observation about the ongoing construction of the Houhai Land Reclamation Area — in Shenzhen’s symbolic geography, the reclaimed areas function as a negation of the previous areas. This is not surprising given the SEZ’s historic role as a negation of Maoist space. However, it is important to note the vocabulary through which the ongoing formation of class identities in Shenzhen is expressed. The most recent, the newest is the best, representing the improvement of the past. In practice, this symbolic geography has depended upon building large projects on unclaimed or reclaimed land. As unclaimed and reclaimed land become increasing scarce, however, this has meant that razing older areas has become the preferred way of creating “new” space. Consequently, these new spaces do not only negate the old symbolically, but increasingly depend razing old neighborhoods and the displacement of poorer residents, so that the negation becomes explicit — you and your type not welcome in the city. At present this logic is most visible and visceral in the urban villages. Nevertheless, here in the older section of #8, we hear the bulldozers on the horizon. More notes and images of the Houhai transformation, here. This entry was posted in noted and tagged class formation, concrete sidewalks, houhai, land reclamation, land reclamation project, shekou, street life. Bookmark the permalink.